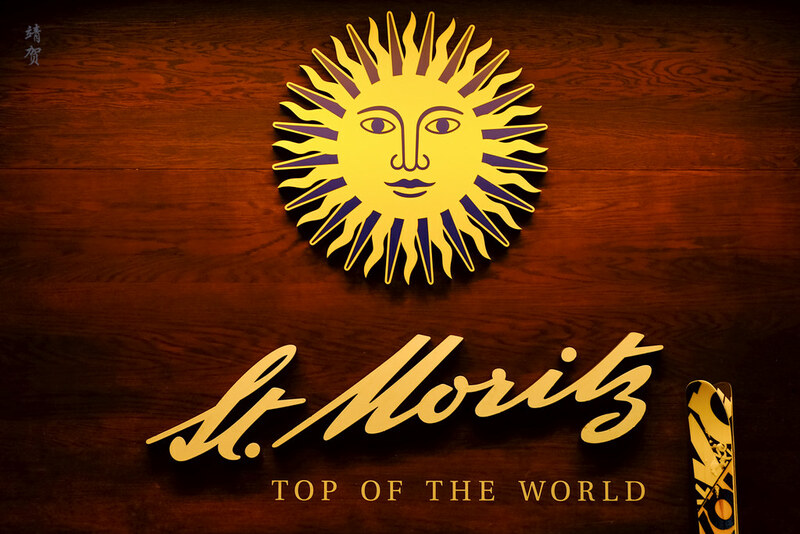 St. Moritz, the name alone is known even in Asia with many luxury property developers keen to associate their developments with this luxury enclave for winter sports. As one of the stops along the Bernina Express between Chur and Tirano, the town exudes a certain sense of old world grandeur and that fame has brought with it developments that made it appear more modern compared to the other Swiss Alpine towns. Skiers can get here via rail, air or car. 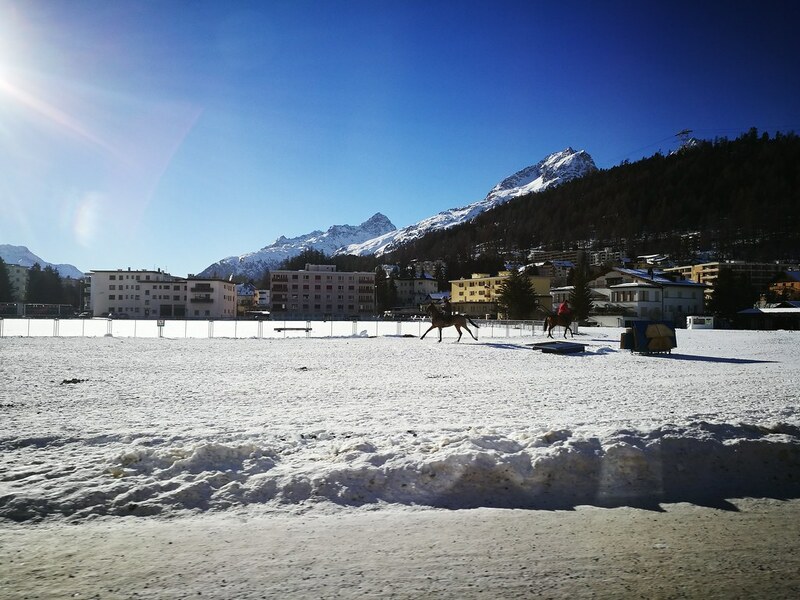 However the St. Moritz train station is not exactly located in the most convenient part of town and is a bit of a drive or walk to any hotels or lodging. Thus travellers should get their hotels to pick them up from the station if possible as taxis are not always available. Otherwise private and unscheduled air services allows arrival into Samedan Airport, though this is limited to the wealthy and larger groups with the means to hire a plane or helicopter. 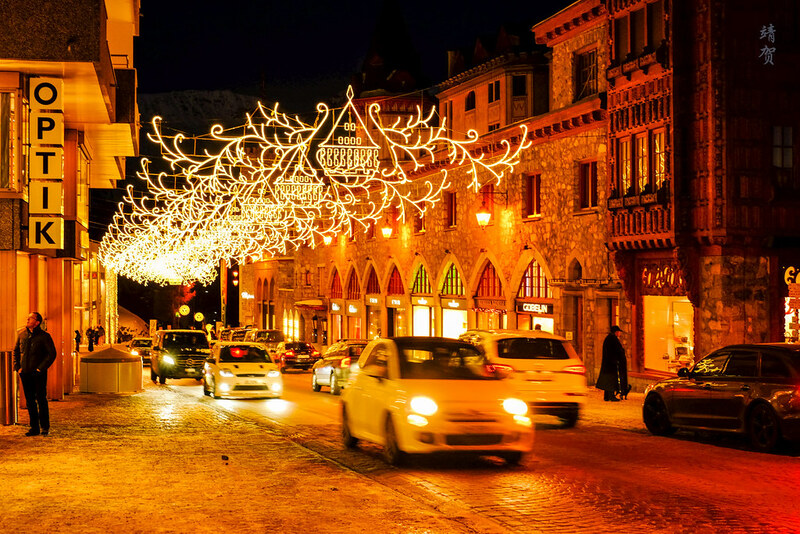 Visitors driving here could start their journey from Chur or Tirano which is one of the largest towns closest to St. Moritz. The largest metropolitan centers for international visitors would be Zurich or Milan, both about 3 hours away by car and Munich about 4.5 hours away. 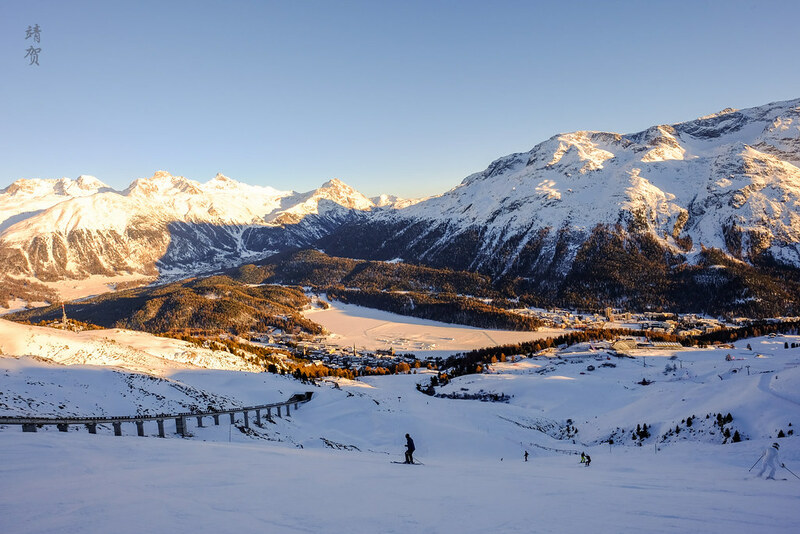 The town might be called St. Moritz, but the ski resort or mountain is known as Corviglia, and there are 3 main bases to ski this mountain resort. 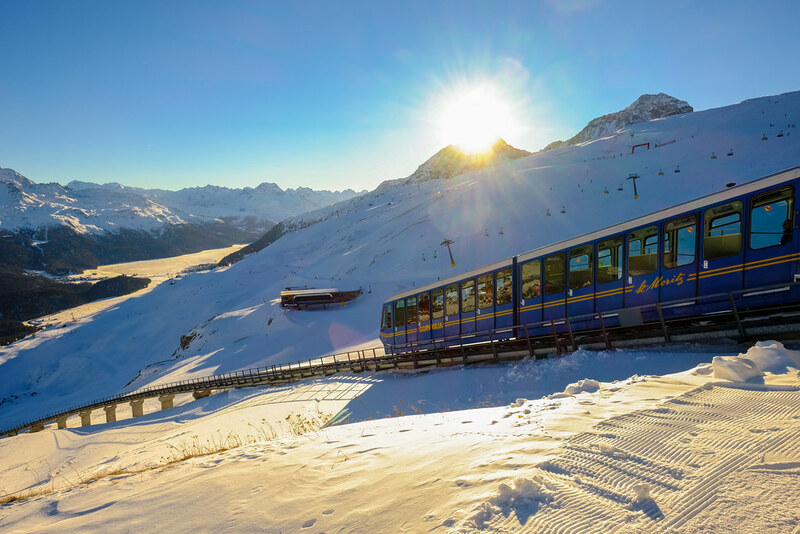 The first base is the cable car at Celerina which is just beside the train station with its own village about 3km away from the centre of St. Moritz. The second base is St. Moritz Dorf which is where visitors can take the funicular railway up with a stop in Chantarella. 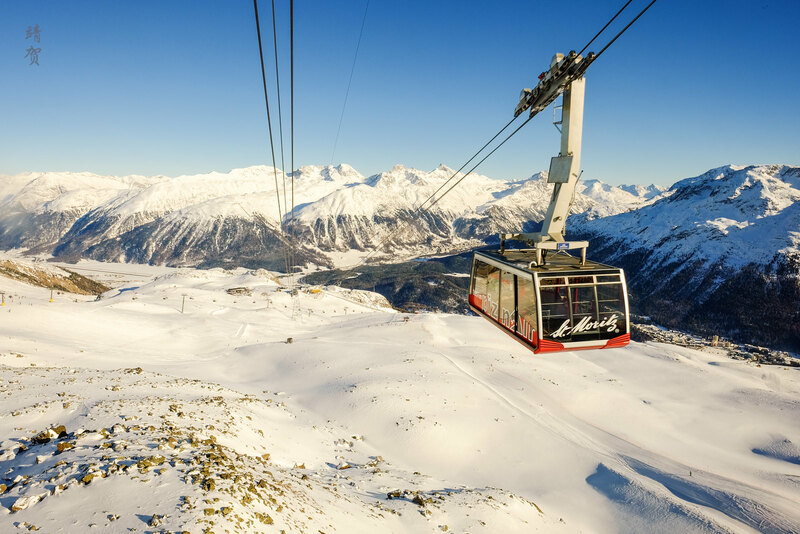 And then for visitors staying in Surlej or Silvaplana, it is probably the quickest to get up via the aerial tram that departs out of St. Moritz Bad to Signal station before connecting to the 4-seater Alp Giop chairlift. 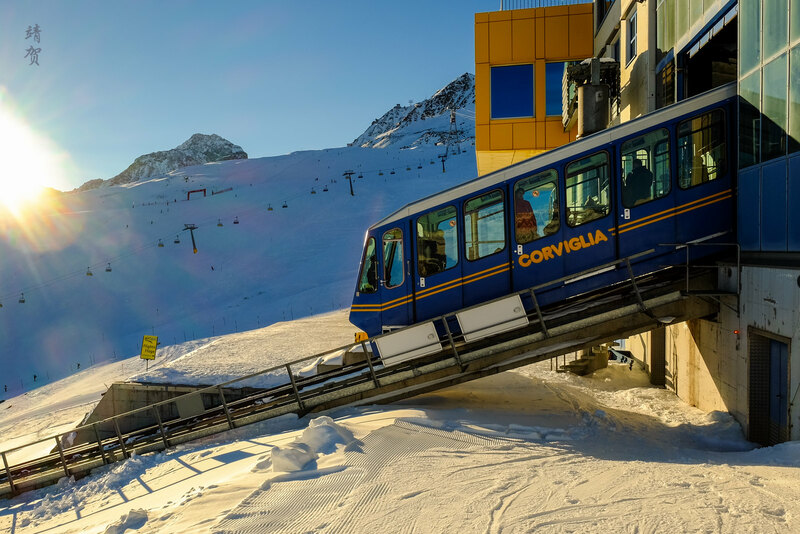 From the center of the action at Corviglia, an aerial tram will connect skiers to Piz Nair at 3,057m, also the highest lift accessible point for photographers and skiers. The journey up on this gondola is also noteworthy as it passes the starting point for the FIS ski races downt Munt da San Murezzan. Otherwise there are plenty of quad chairlifts on the front side of the mountain, with Alp Giop and Salastrains reaching the same area at the top that provides skiers a way out to Corviglia. 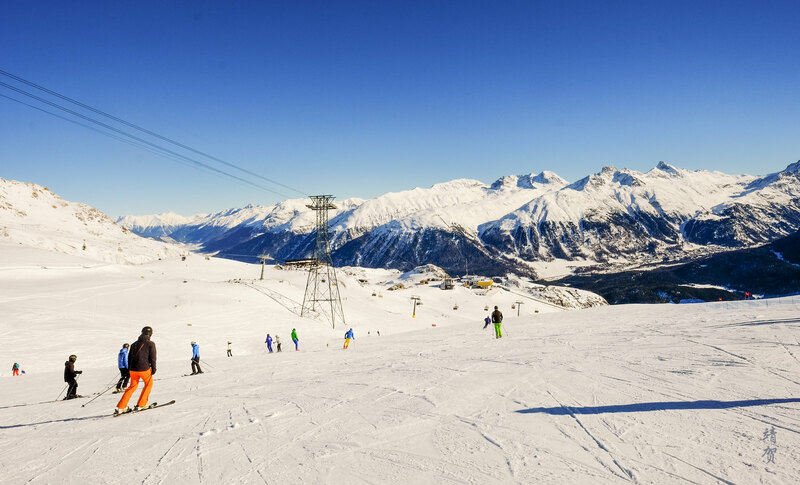 On Corviglia ski area, the FIS quad-chairlift provides a short ride for access to the Audi Ski Run area while the Plateau Nair and Marguns-Corviglia quad-chairlift brings skiers from the Marguns base to Corviglia. 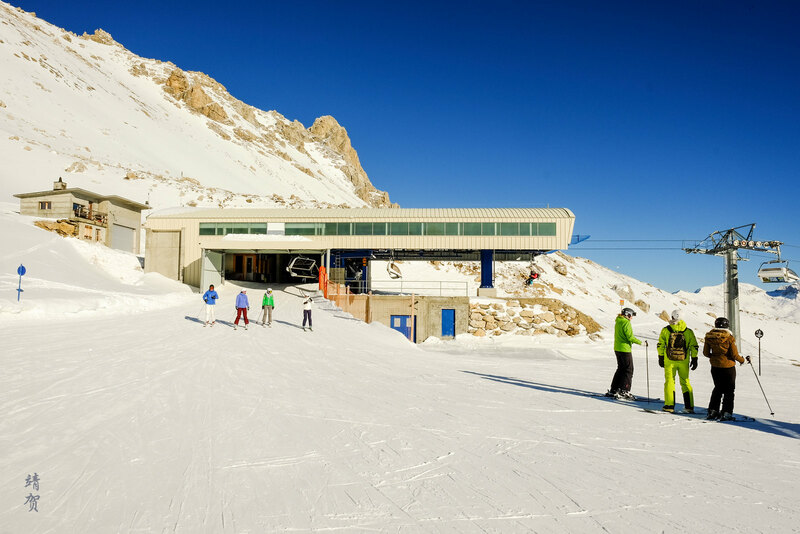 On the Marguns side, a 6-seater Trais Fluors chairlift opens up terrain for advanced and expert skiers and allows skiers to connect to the Glüna 4-seater chairlift. 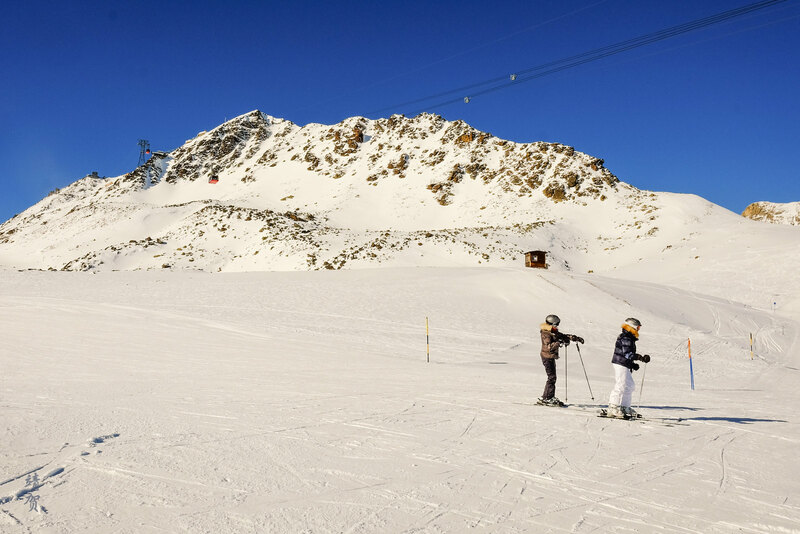 The advanced and expert terrain at the backside of the mountain is also served by the 4-seater Lej de la Pêsch chairlift and the triple Fuorcla Grischa chairlift. These 2 areas usually see less crowds due to the location at the back of the mountain and the steeper terrain that they serve. It is worth noting some of the newer chairlifts here like the one from Marguns have an automatic bar that goes up and down to ensure safety. Many of the chairlifts also have disembarking after it turns at the top rather than a straight frontal drop-off. Prices for skiing here is the same as in Corvastch, since they can be accessed on the same Engadin card. As with my previous mountain review, the cost was just CHF35 (~$36) for one day when staying at a hotel or resort in the area. Though guests need to stay for a minimum of 2 nights and purchase a minimum of 3 days. Still the cost was a lot cheaper than many resorts anywhere around the world. 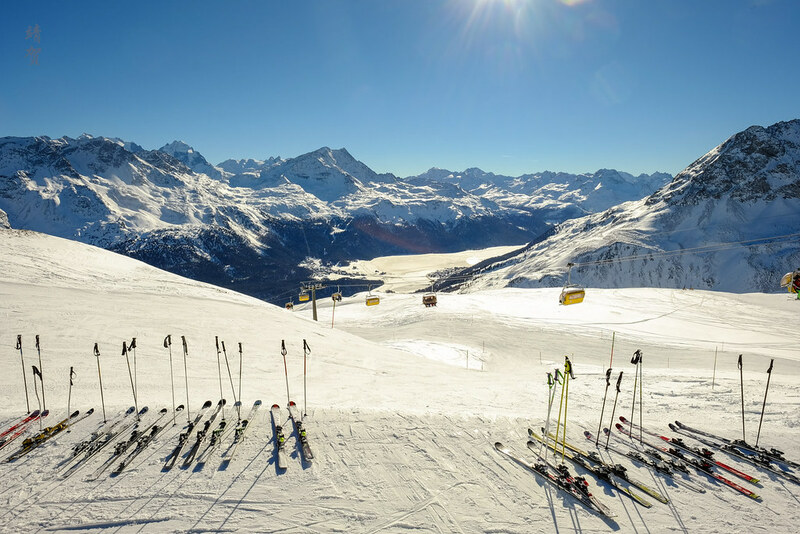 In that sense, I see tremendous value when using the Engadin card to ski in Corviglia – St. Moritz. 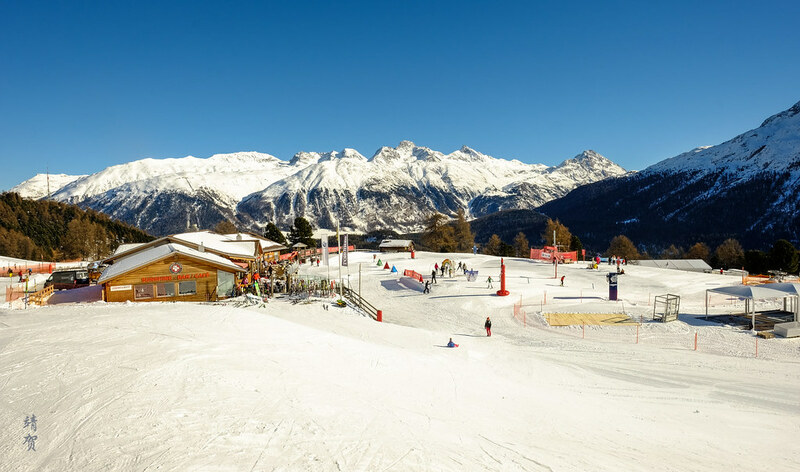 Granted the terrain in Corvatsch is quite limited but Corviglia – St. Moritz provides terrain for all kinds of skiers and does provide fun times for both skiers and snowboarders! 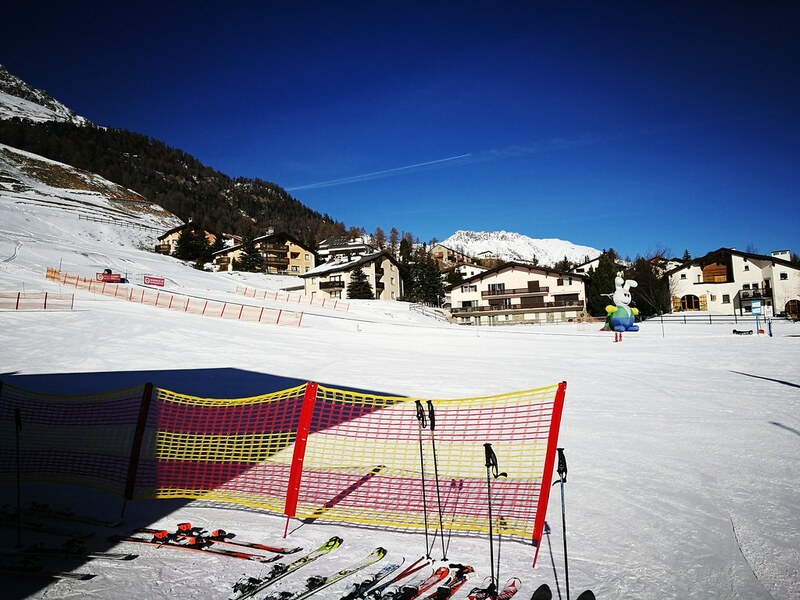 There are several ski areas for skiers new to the sport, namely with a cordoned ski school area right outside Salastrains Hotel. And there are learner’s areas served by T-bars at Marguns (beside the Restaurant and ski lodge), at the base in Celerina, and at the other side of the mountain in Suvretta outside Suvretta House Hotel. 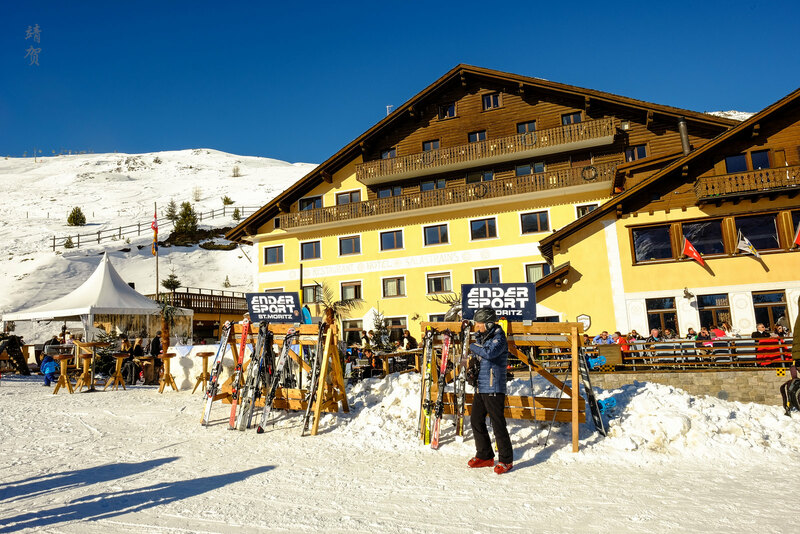 The proximity of learners’ areas beside ski lodges, hotels and restaurants provides a great area for families to keep an eye on their kids while they rest inside if they are not skiing. Otherwise it is also convenient for those learning to take a break when they need it. 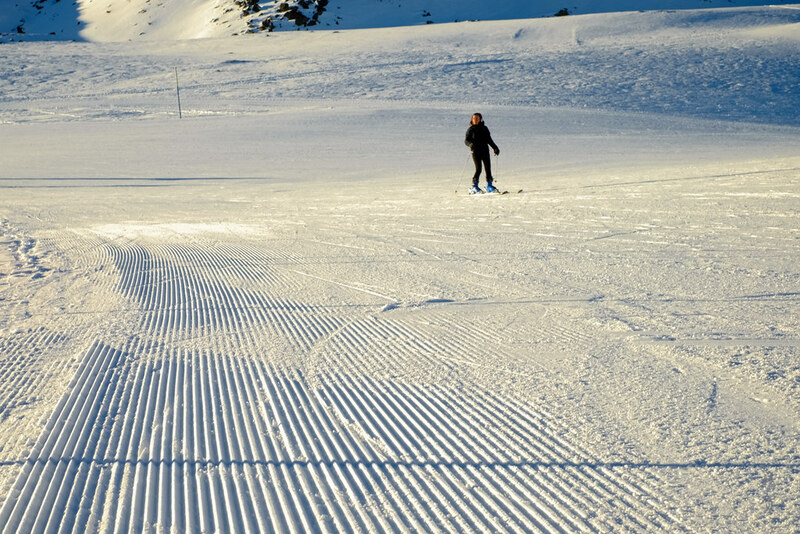 Upon progressing, beginners can really delight in wide groomed runs around Corviglia and underneath the FIS chairlift. There is also easy trails that traverses between the top of Alp Giop and Salastrains over to FIS and down to Corviglia before returning back to Signal. This blue run allows skiers and boarders to progress while having easy access to chairlifts and gondolas to the top or back to the base, while enjoying all the sights provided from the front side of the mountain. There are also blue runs from the top of Glüna and Trais Fluors chairlift that leads back to Marguns but because some of then strays into red territory and features slightly steeper terrain with more advanced skiers whizzing by, they could be a bit intimidating. Red ski runs here are built for carving and speed especially on the front side of the mountain. On the front side, the Salastrains chairlift provides access to the same terrain used in FIS Ski Races from the top of Munt da San Murezzan to the base at Salastrains where several restaurants and cafes awaits. Another quad chairlift, Randolins – Munt da San Murezzan links both the Paradiso and Swing ski run which is moderately long with some curves and steeps in between for an interesting run. 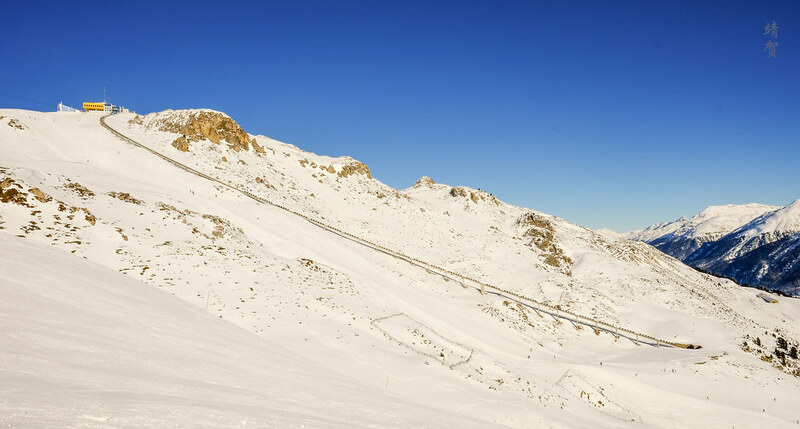 For longer ski runs, advanced skiers can head up to Piz Nair and go down the Grischa run linking to the Lej de la Pêsch chairlift and then going down Schlattain run between the Val Schlattain, ending out in Marguns and continuing down towards Celerina. This long run should provide an intense workout even for stronger skiers and whip up an appetite at the end which is good since Celerina is another village with plenty to offer in terms of food. 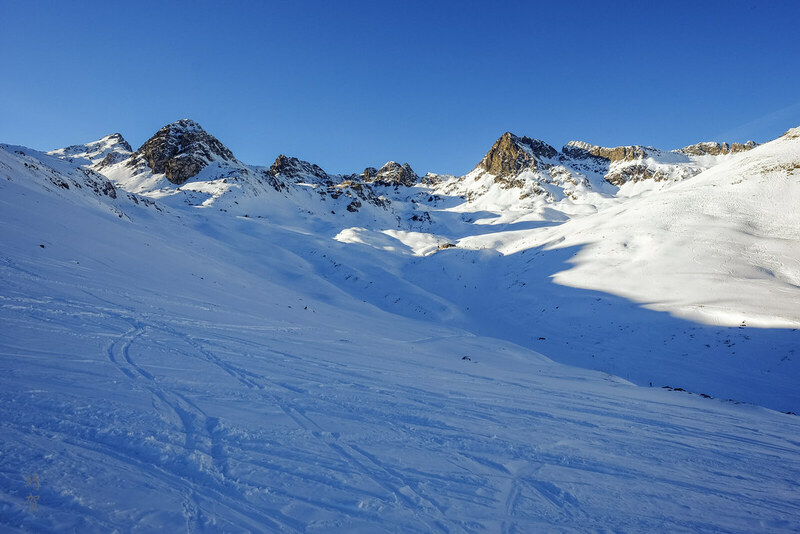 Intermediate skiers looking to experiment and progress further can do so by repeating their runs in Lej de la Pêsch and Glüna which offers less crowds and moderate to slightly more challenging terrain. These red marked ski trails should offer plenty for intermediate skiers to spend more than one full day and the snow in the back can sometimes be better as well when the sun comes out for the week here. For a resort with plenty to offer in terms of blue and red runs, they surprisingly have plenty of black marked runs. Even though I do not usually go for steep black diamonds, I found these black runs reserved for experts to be quite mild and attainable to advanced skiers and strong intermediates. 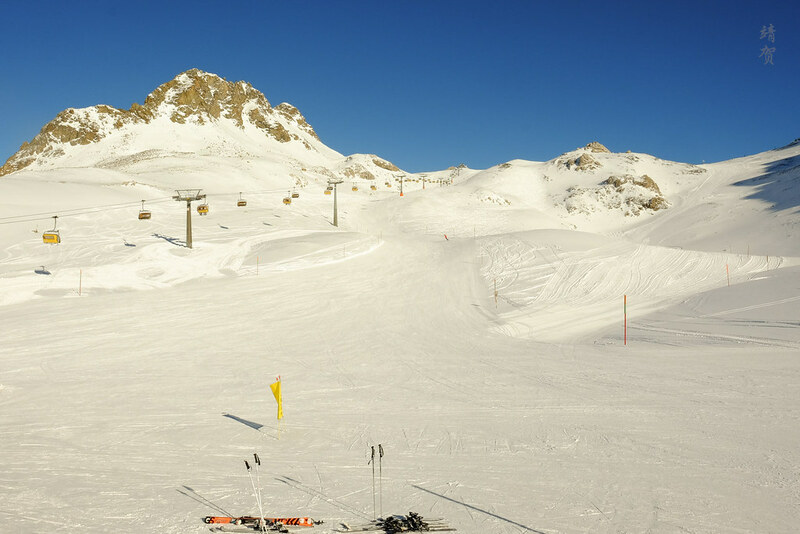 There are even black runs on the front-side of the mountain such as Lanigiro starting from the Chamanna ski lodge. There is also the Muntanella ski run from the bottom of the FIS chairlift and easily accessible from Corviglia station to Salastrains Hotel. As a venue for past Olympics, expert skiers could also try the Olympia run from the bottom of Runzöl back to Chantarella. However due to the lack of snow cover in the 2016/2017 season when I visited, this run seems a bit patchy at the bottom and thus I do expect it to be closed in the early season or when there is a lack of snow. 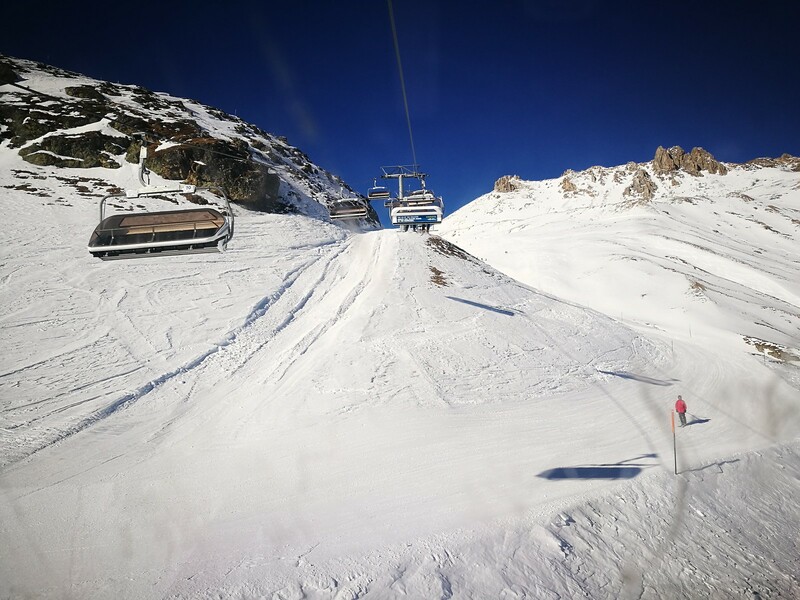 A more snow-sure area for expert skiers is perhaps Fuorcla Grischa that spans the entire journey of the chairlift named after it, and the upper parts of Glüna which is more like a more difficult red marked run as some of it joins to a red intermediate run. There is also the Selin run from the top of Trais Fluors to the base at Marguns that has great views and a moderate length that expert skiers can easily access with lesser crowds. Due to the lack of snow or partly perhaps to clientele, this resort does not seem to be big on off-piste or backcountry skiing since there was not much signs. Snow cover was not good at the back with plenty of rocks jutting out could also be the problem even at the summit. However there are certainly open snow areas without trees around Lej de la Pêsch, Alp Giop, Salastrains, Fuorcla Grischa, Trais Fluors and Glüna chairlifts that offers off piste opportunities allowing skiers to search for fresh snow packs after the storm hits. With most of the skiable area above the treeline, there is not much tree skiing here like in many ski resorts in the Alps. However there is a snowpark off Corviglia with jibs and rails for tricks, and this area is also served with its own T-bar and easily accessed from the Marguns-Corviglia chairlift. 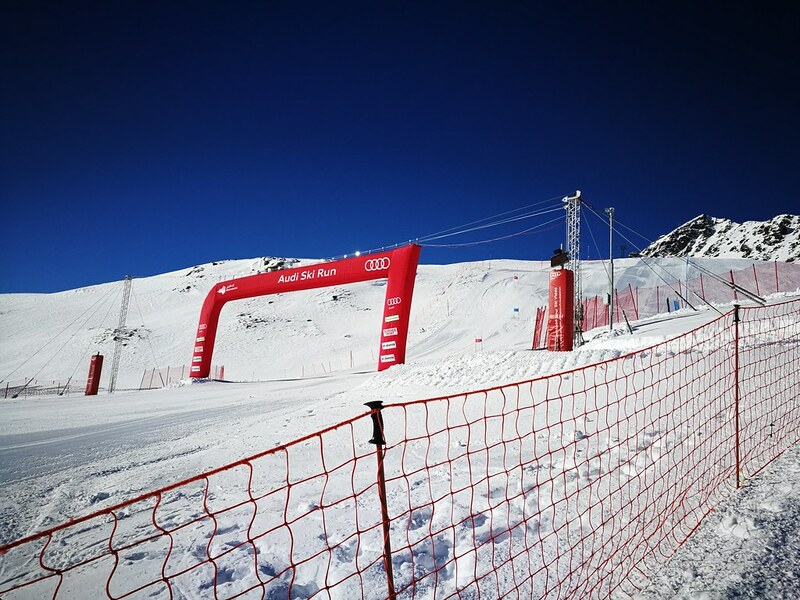 Otherwise the Audi Ski Run area is quite popular with skiers able to take part in a ski course while having their ski runs recorded for free in an area off the FIS chairlift. Skiers could then download the ski runs or share it via social media. 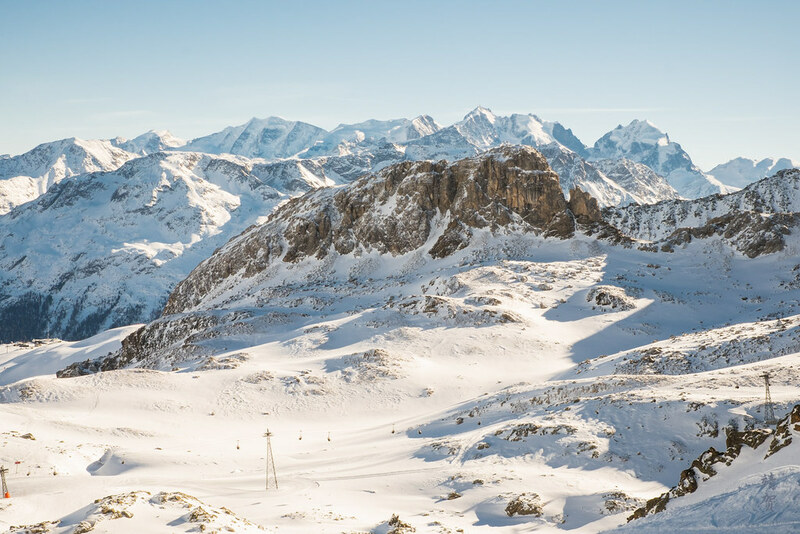 Geared towards luxury in mind, Corviglia – St. Moritz has a nice variety of lodges ranging from new builds with glass and steel to more traditional Alpine huts that offers plenty in comfort. The Corviglia funicular station itself is quite large and is perhaps one of the major base for activities. Visitors can get tickets here, enjoy a meal, purchase souvenirs and necessities or just take a break from the cold. Across from the station, there is the chic and modern Quattro bar which seems to be part sponsored by Audi. Offering refreshments and light food, the Teutonic glass exterior and modern interior will sure catch the attention of skiers. 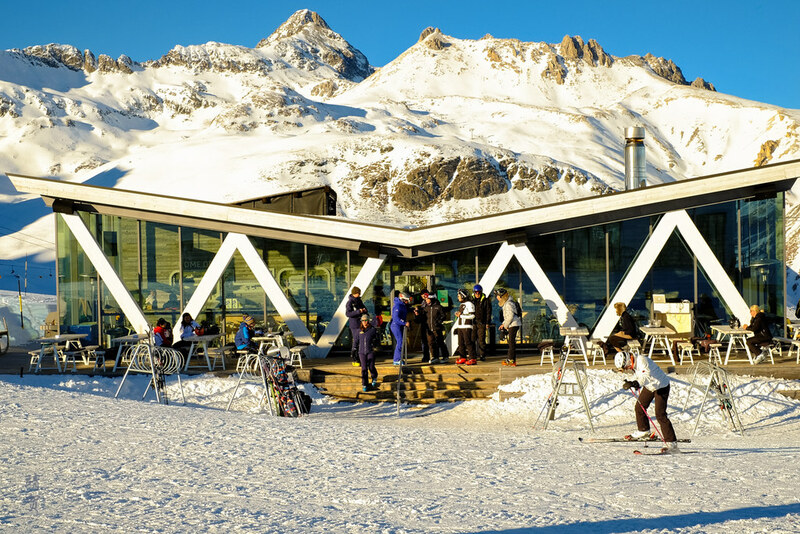 For skiers who prefer more traditional Alpine architecture, they can choose from Chamanna restaurant located slightly below the Alp Giop and Randolins-Munt da San Murezzan chairlift, the lodge at Lej de la Pêsch, or the restaurant at Marguns. These places offer outdoor patios and timber roofed cavernous interiors with a warm ambience and plenty of seating. 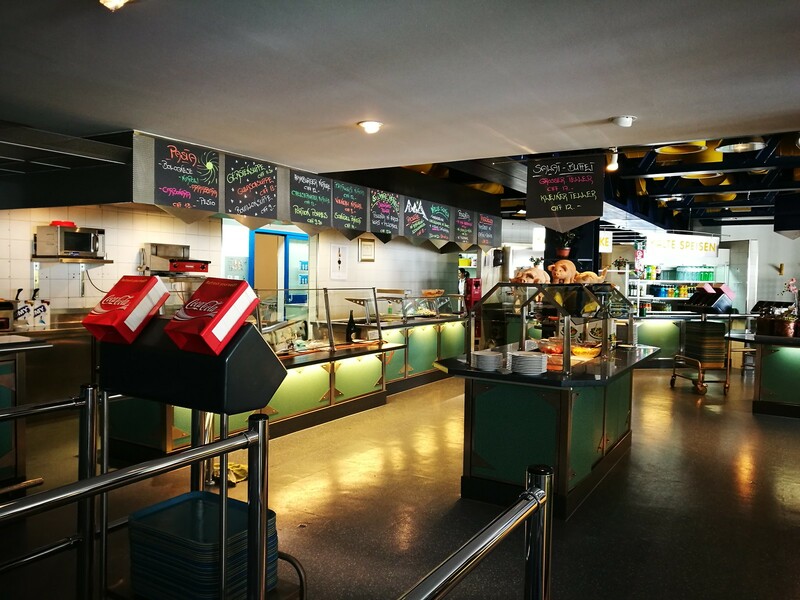 Suitable for groups and families, they can get quite crowded during lunch hours as they offer the more traditional lunches found in European ski resorts. Otherwise there are some other lunch spots like those at the Glüna base or at Signal Stübli right on top of the Signal gondola. 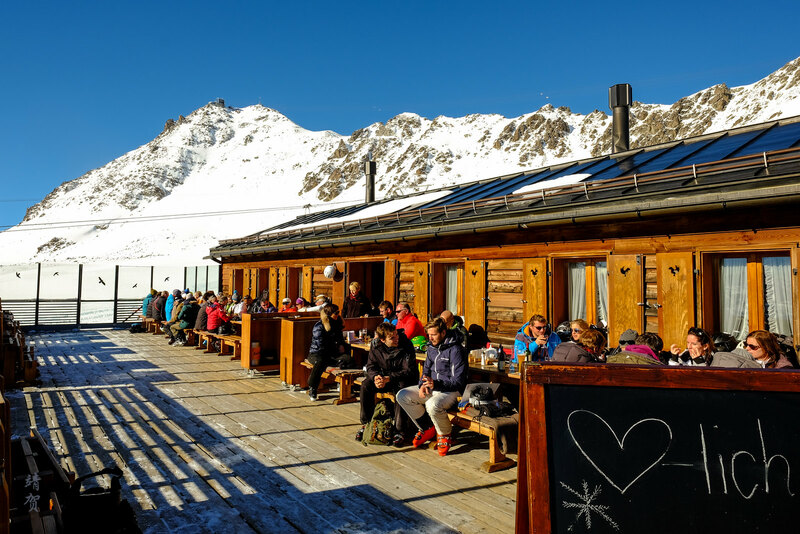 Skiers could also have lunch at the several restaurants and cafes at Salastrains. Basically for a medium sized mountain, there was plenty of on-mountain lodge to take a break and grab a bite. 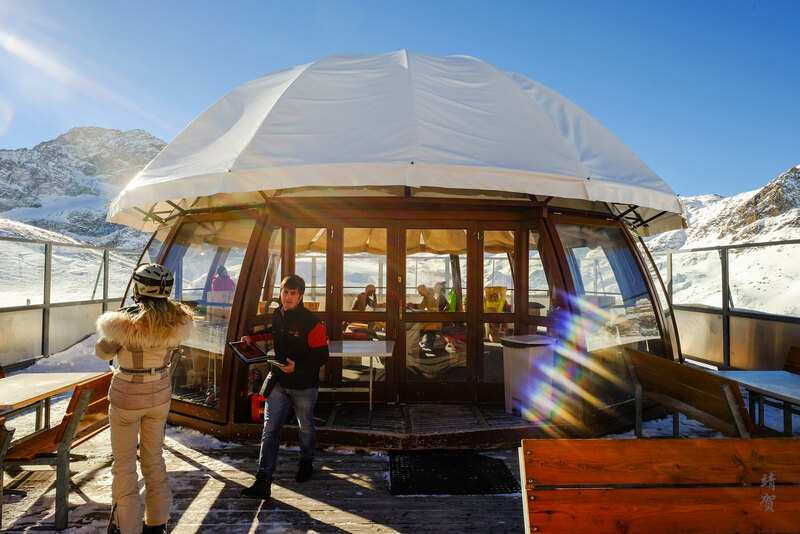 Some of these spots offer panoramic views as well like the terrace at Piz Nair that visitors can linger to take photos. 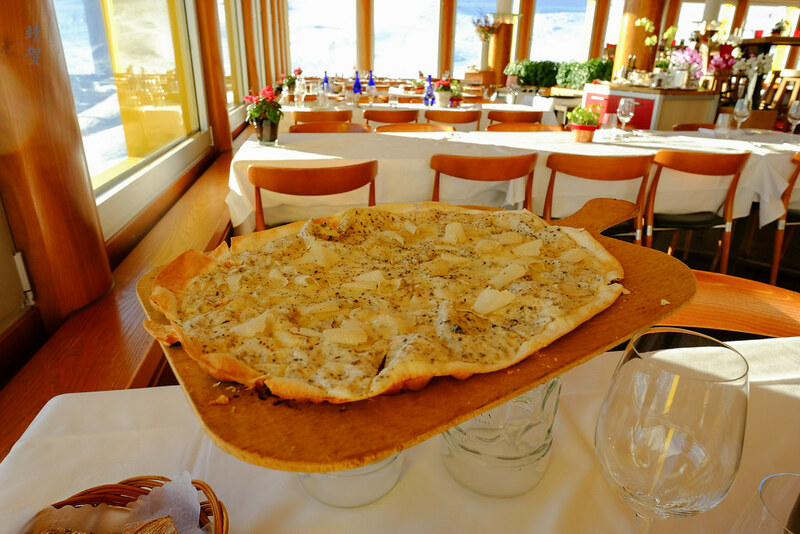 Unlike the Austrian ski resorts, the food served in St. Moritz has more Italian specialties with pasta and pizzas being a mainstay in many ski lodges. 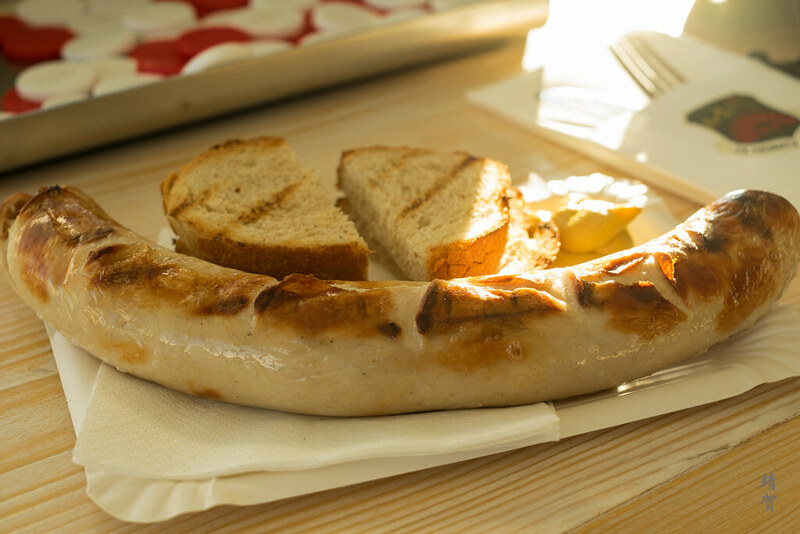 There are also wursts at the bars and other Swiss cuisines like raclette and cheese in Chamanna. For many of the ski lodges, dining prices are slightly higher but still acceptable for a ski resort. Burgers cost between CHF12-15, while pastas sells for CHF16-20 in the self-serve dining outlets. Catering to an upscale clientele with its fame means skiers can get some fine gourmet delights here on the slopes. 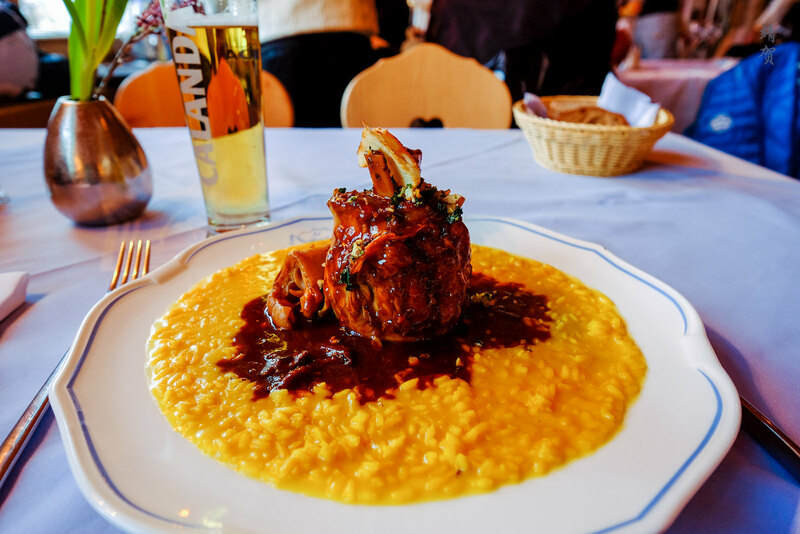 For example they can dine on saffron risotto with pork knuckles at Salastrains, or they can have white truffle pizza at Mathias Food Affairs in Corviglia, or maybe have a traditional Swiss Raclette with Black Truffles at Alpina Hütte. Of course these gourmet delicacies will set one back, and expect to pay between CHF50-100 for these main courses. As a result, how much one wants to spend to eat on the slopes is really up to how padded your wallets are! For what it’s worth, it was definitely the first time I saw such a vast range of truffle dishes on the mountain slopes and had the chance to try out some of them. With that, I can say these are some high quality dishes with real truffles that one could only get in high end restaurants at large cities. 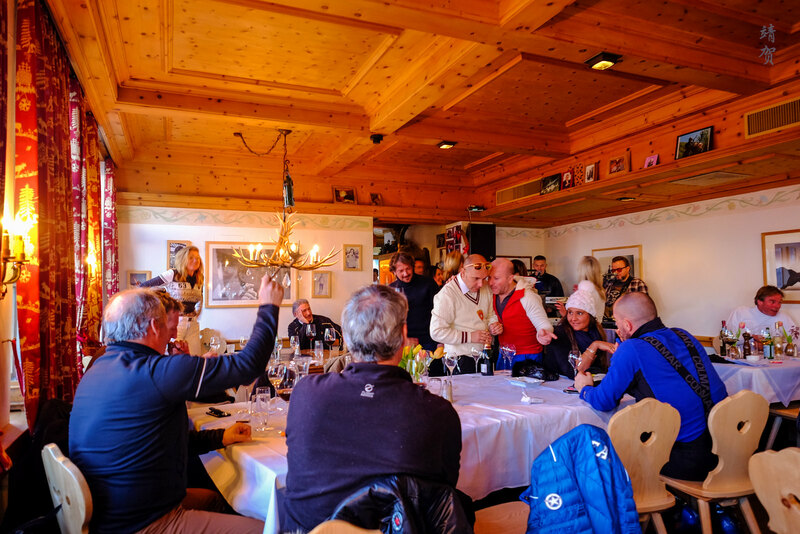 Thus I do recommend skiers with the means to give it a try while in St. Moritz for the food here could well be one reason to ski at the same time. Naturally, the range of beverages here does not fall short with such an impressive food menu. Expect top shelf champagnes to be offered alongside Sprüngli hot chocolates with all the toppings. Indulgence here after skiing seems to be the main theme which is fitting considering its target market. 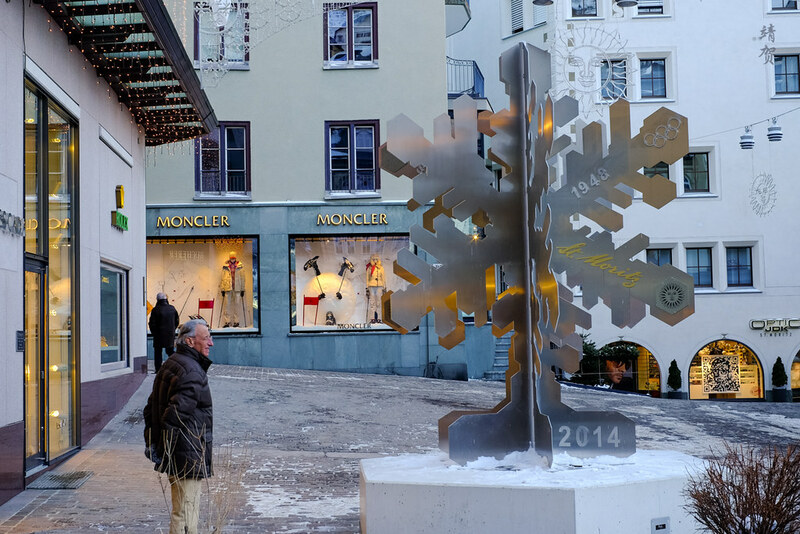 St. Moritz might be well known as a ski resort but that does not mean it has plenty of ski-in/ski-out properties. My guess is that some visitors here do not even come for the downhill skiing, hence most skiers return to the base via the funicular, ending up at the town centre. The famous hotel here is Badrutt’s Palace Hotel, an institution in its own right with a history that is intertwined with the town and a prominent pioneering family that contributed to much of the town’s development. 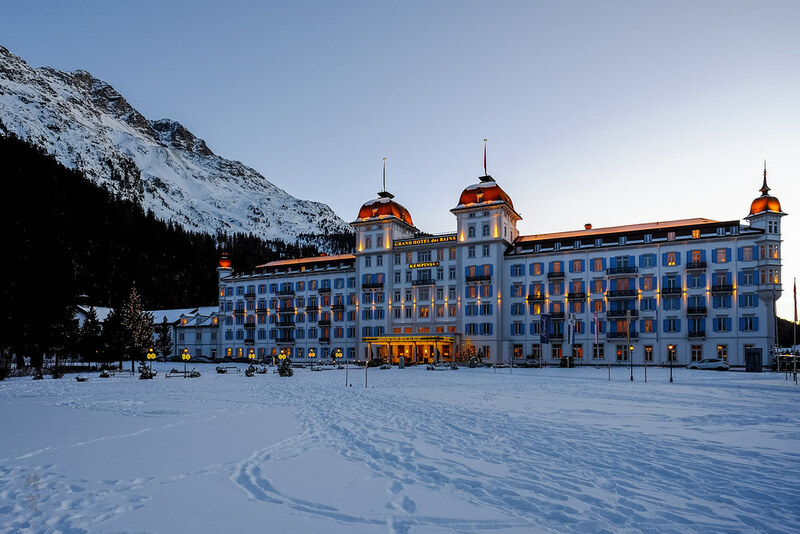 For skiers who prefers to stay close to the cable car, there is the Kempinski Grand Hotel des Bains in St. Moritz Bad just across from the Signalbahn gondola. Suvretta House, part of the Leading Hotels of the World is another luxury option that is a ski-in/ski-out property connected to the Suvretta-Randolins chairlift, while the Hotel Salastrains is perhaps the best hotel for ski-in/ski-out since it is just by the base of the Salastrains chairlift. However staying in these hotels means taking a free shuttle (if available) or the public bus to the town as it is quite a distance to walk during winter. St. Moritz is also not the best ski town to walk in, thus I do recommend first time visitors to stay close to the base of the Corviglia Funicular, with Crystal Hotel and Hotel Monopol being the larger hotels closest to the town centre. Otherwise, Hauser Hotel and Hotel Schweizerhof is also recommended for location and proximity to the funicular station. Aside from hotels, there are always the possibility of apartment rentals, and shared dormitory spaces for rent. 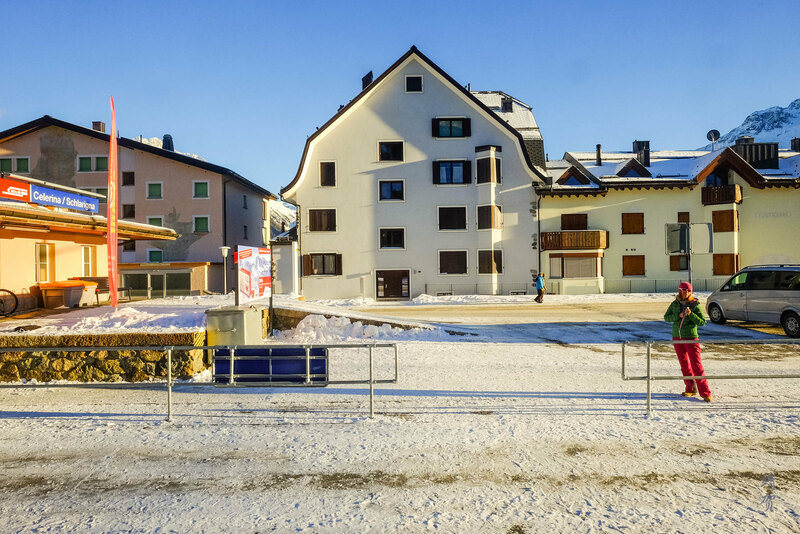 Though visitors looking for these accommodations will be competing with guest workers for come to seek employment in town during the winter season, and they would have to be content with staying in Celerina or Surlej, away from the town centre. 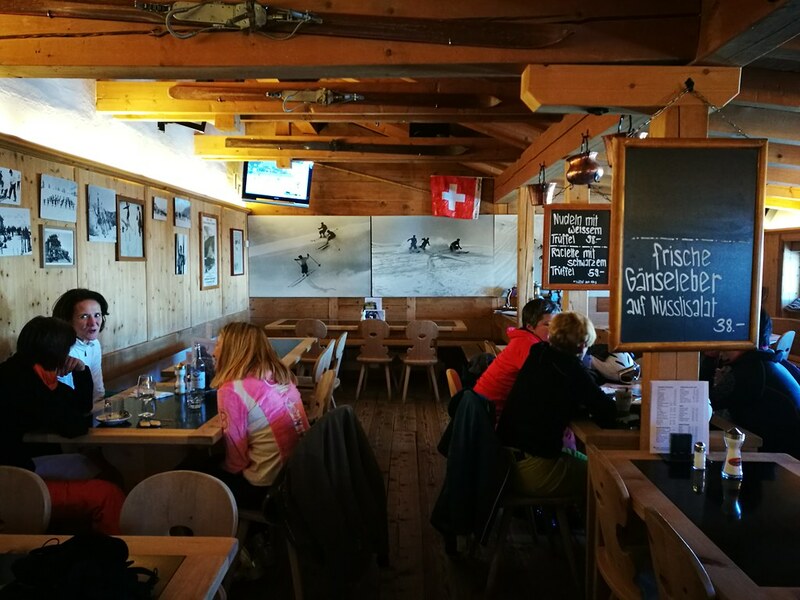 Due to the demographics of the skiers that are wealthier and somewhat older, the aprés scene here is a lot more subdued than say in Zermatt. 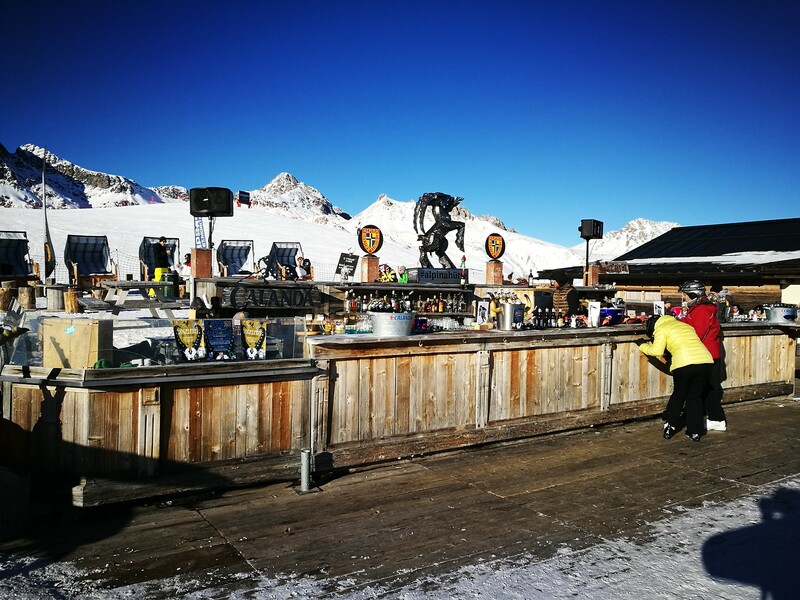 There is Alpina Hütte with outdoor patios large enough to handle crowds on the mountains but most of the crowds seems to head back to town or lower in the mountains to celebrate or have a drink. Many of the hotel bars especially those with a patio should be full especially when the sun is out. Otherwise, Restaurant Salastrains can be packed at the end of the ski day with an Italian crowd. At the end of the day, the crowds here are quite spread out though do not expect any rowdy party scene. In fact the best bet for socializing and a bit of partying would be back in town as skiers could join the residents themselves to unwind after the sun has set. 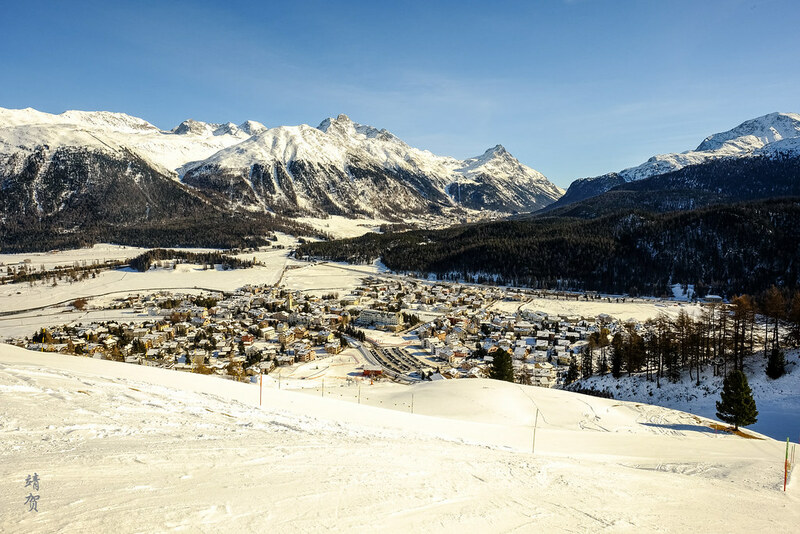 Skiers should also remember St. Moritz is a functional town in itself, and thus there are plenty of activities aside from downhill skiing. Horseback riding is huge here, along with cross country skiing across the lakes. Ice hockey is another major recreation here with rinks on the lakes and in town. As such, the crowds are centred mainly in town at the various venues, and many skiers can end the day early to partake in these other activities in the afternoon. Photographers would love St. Moritz. While it lacks the iconic peak of the Matterhorn, the beauty of its natural landscape set amongst frozen lakes is sure to win the hearts of many. 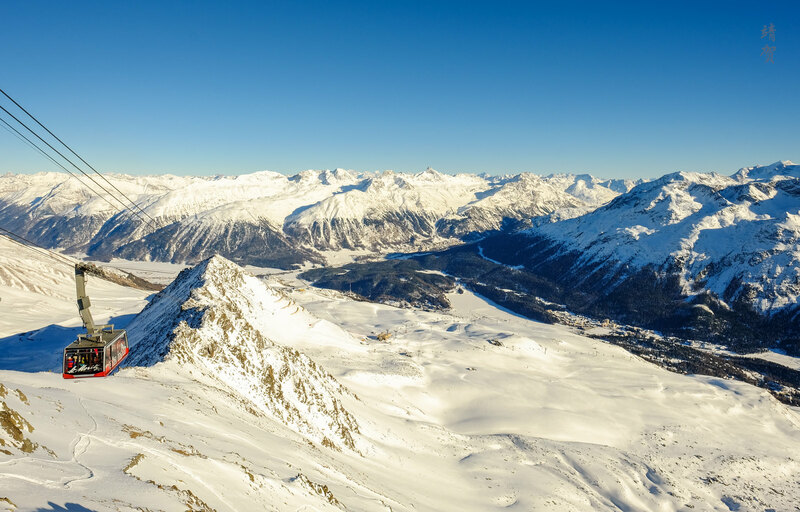 From Piz Nair, visitors can admire the setting that makes St. Moritz a draw, while looking at its backcountry, they can be awed by the craggy peaks. The views at the top here is one of the best in the Swiss Alps and that certainly makes it a point for visitors to travel here even during the winter. After all, amongst mountain views in Switzerland, I would say St. Moritz rounds up the top 3 along with Interlaken and Zermatt. During the duration of my stay, there was some fresh snow a few days before I arrived. But the whole time I was there, the sun was out every day and it was skiing under blue skies which made the scenery all the more beautiful. However it did impact the snow cover on the mountains as the slopes can get slushy and icy at the end of the day due to the sunshine. Thus snow quality was not the best since the Alps have had a poor winter season for skiing in 2017. With that understanding, the skiing was not perfect. 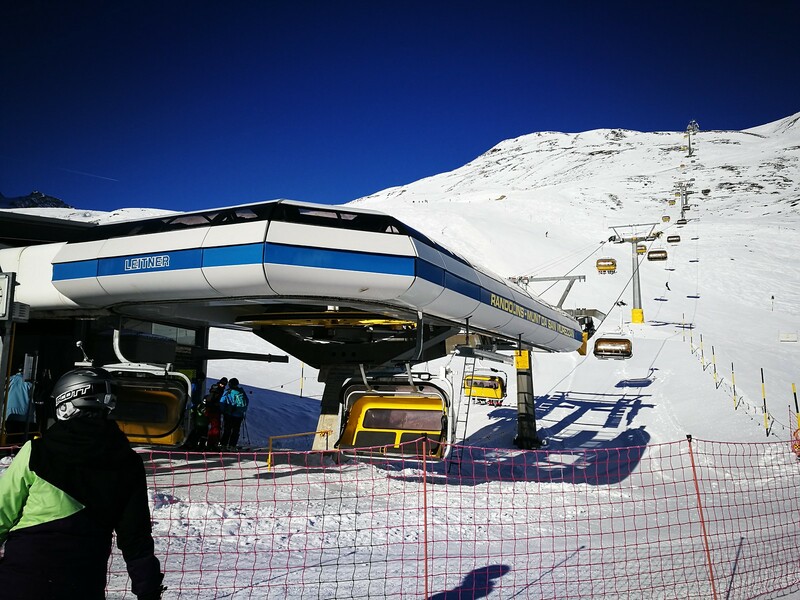 While I did not encounter much queues on the chairlifts or gondolas, the infrastructure was a bit lagging considering I arrived here from the Austrian ski resorts which have faster chairlifts and more modern and impressive cable car systems. The only thing that wow-ed me was the variety of food and the wide variety of activities one can do aside from downhill skiing here. 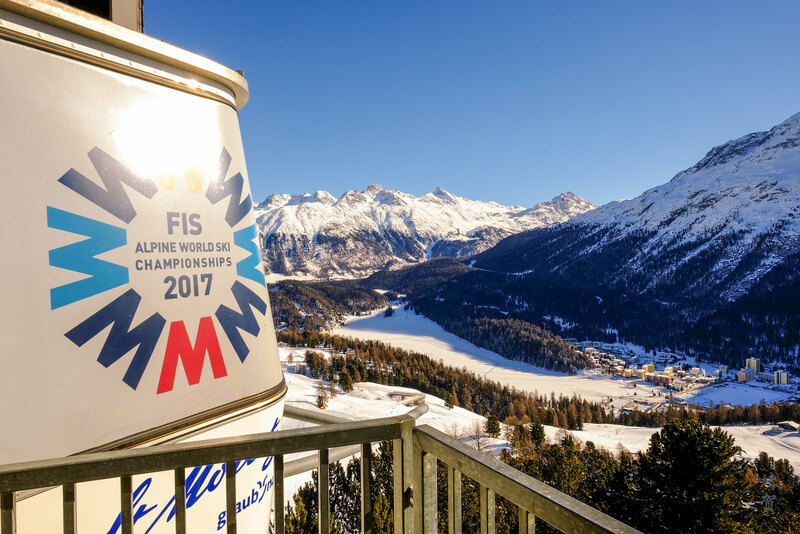 As a pure skiing destination, St. Moritz is down on the list, but as a winter travel destination, it should rank high up there on anyone’s list.